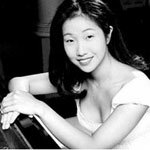 Lucille Chung was born in Montréal, Quebec, this 34-year old has been heralded as an impassioned and refined concert pianist. She made her debut with the Montréal Symphony Orchestra at the age of 10, and was invited to be a featured soloist during its Asian Tour in 1989. Since then, she has performed with numerous Canadian orchestras as well as several international ensembles including the Moscow Virtuosi and the Philadelphia Orchestra. She has given recitals at the Kennedy Center in Washington, D.C., New York's Weill Hall at Carnegie Hall, the Concertgebouw in Amsterdam and the Ford Centre for the Performing Arts in Toronto. In 1998, Ms. Chung was the winner of numerous competitions in Italy including the 19th International Pescara Competition, the VI Concorso Internazionale "Riviera del Conero" and Concorso Internazionale Pinerolo Citta della Cavalleria. In 1999, she was awarded the prestigious Virginia Parker Prize by the Canada Council for the Arts. Lucille Chung graduated from the Curtis Institute of Music and the Julliard School where she worked under Seymour Lipkin. Presently, she is studying at the Accademia Pianistica di Imola with Giovanni Valentini. Ms. Chung is fluent in French, English, Korean, Italian, German, and Russian.